The interior of the dome of the Legislative Building in the City of Winnipeg in Manitoba, Canada is a small part of the stunning architecture of the antechamber. As you enter through the formal entrance to the Legislative Chamber in the Legislative Building in the City of Winnipeg, Manitoba, the interior of the dome is a highlight. 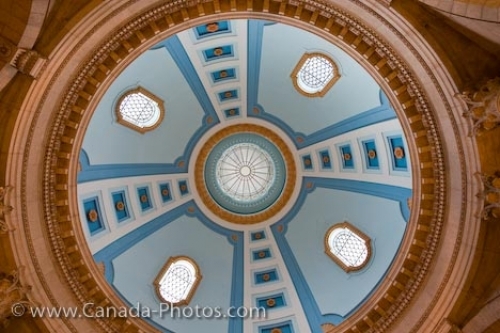 The dome rotunda is a common piece of architecture found in many government buildings across, Canada, this one located at the head of the grand staircase. The curve of the dome sits 87 feet above the antechamber with 4 panels curving towards the centre. Each panel is separated by a row of 5 gold rosettes with the diameter of the dome being 54 feet across. The dome and antechamber were constructed between 1913 and 1920 with everything being decorated in blue and white hues with the added touch of gold highlighting the dome. Picture of the stunning architecture inside a dome in the Legislative Building in the City of Winnipeg in Manitoba, Canada. ... the exterior of the Legislative Building, the dome can be clearly seen where it is surrounded by statues and topped of with the statue of the Golden Boy. Visitors to the City of Winnipeg, can book a tour through the Legislative Building and view the architecture of the dome and the rest of the interior at close range. The interior of the dome of the Legislative Building (built between 1913-1920) in the City of Winnipeg, Manitoba, Canada.